5 Practices: Elevator or Stairs? My learning goal for this lesson was to understand the meaning and purpose of finding the point of intersection in a system of equations and make connections between representations. I chose Elevator or Stairs because it’s a dilemma I’ve been intrigued by in the past, it provides a context for systems of equations that everyone can relate to, and selfishly, I spent a lot of time making the task so why not use it? By the way, check out Dr. Clayton Edward’s post about his implementation of this same lesson. He used it in a 6th grade class and provides amazing insight into student and teacher thinking. I also really like that it shows open-ended problems aren’t one size fits all. My learning goal was related to systems of equations, but others could use the task for many other concepts as well. For the anticipation process, I had to anticipate student responses and mistakes for two different phases of the problem. Although I used this to introduce systems of equations, it does not immediately line up with that concept. Instead, the initial question, “Will the elevator or stairs be faster?” will require ratios and not necessarily force students into a systems situation. 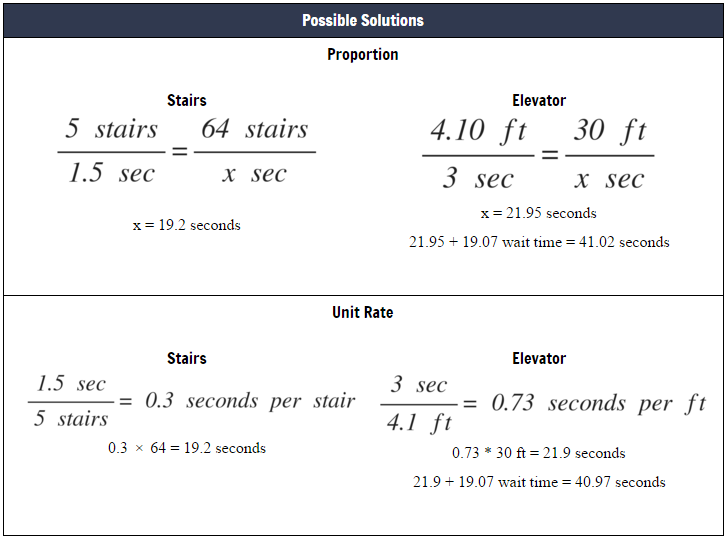 However, the sequel question, “At what floor would both the elevator and stairs take the same amount of time?” is perfect for systems, and it is the question that will drive the rest of my lesson (and much of the systems unit). Therefore, I started by creating the following chart for the first question and worked the problem out in ways that I thought the students might approach it. After creating the list of possible solutions in the anticipation stage, I actively looked for these strategies during the group work session in order to take note of which groups were using what strategies. Since systems of equations was my focus for the overall lesson, I narrowed my focus specifically toward the strategies used to solve the sequel question. Here’s the monitoring chart. As the groups worked, I noticed that most were using tables to try to figure out where the point of intersection was. In addition, a few students wrote equations and used a calculator to see what the graph looked like. Finally, a couple students used what I thought was the coolest method of the day (which I didn’t anticipate). They set the equations equal to each other and solved for x.
I was really excited about this because they unknowingly used a method that we would be learning a few days later. Since most of the groups used the table method, I had one group present this method from each class. I also selected a group that used equations. If there were multiple equation groups, then I selected the group who set the equations equal to each other because I really wanted to show off that strategy. Also, I chose speakers based on who has and hasn’t presented in the past. I want to make sure as many students as possible get a chance to be the center of attention throughout the year. For the sequencing process, I decided to have a group present the most commonly used strategy first. This is a recommendation from the book that I like because it allows the highest percentage of students to have investment in the presentation process. Since most of the groups used the table method, they would be immediately curious to see how the first presentation compared to their work. After a group presented the table method, I had a group that used equations present next. Specifically, I wanted to highlight the few groups who set the equations equal to each other in order to arrive at a solution. We could slow down the stairs by introducing one more stair. 5 stairs / 1.5 seconds = 65 stairs / x seconds. 65 stairs / 19.5 seconds. On the other hand, we could speed up the elevator. Say, 4.5 ft / 3 seconds, which is 1.5 ft / 1 second. 30 ft / 20 seconds. 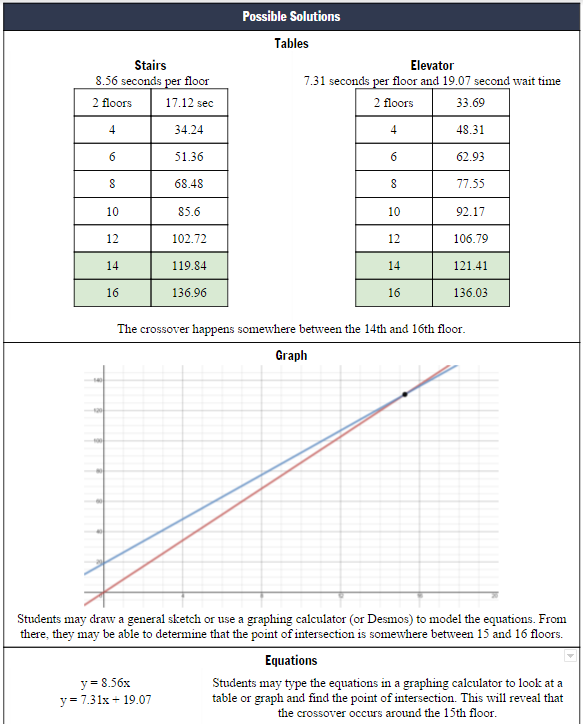 Slowing down the stair-choice gave 19.5 seconds, and speeding up the elevator-choice gave 20 seconds. If the slower-stairs are quicker than the faster-elevator, then the true stairs are also quicker than the true elevator. Perhaps not a method of solution likely to arise with young students, but, I think, not a bad idea [around estimation] to discuss with teachers. This is awesome, Maya! Another reason to really like open-ended tasks. This is a strategy I would never have thought of. Really cool! Thank you for sharing! Love the activity, have used it a few times in a couple different classes now. I just realized on the sequence question, we have a different time for you to travel one floor using the stairs. I am not seeing how you got 8.56 per floor. If you traveled 3 flights of stairs in 19.2 seconds, shouldn’t you be traveling down each flight of stairs at (19.2 / 3) 6.4 seconds per floor? I may be missing something obvious here… help me out! Thank you for the kind words! I really appreciate it. For the sequel, I used the actual time it took to travel the stairs in the Act 3 video (25.67 seconds) and divided by 3. I did this because the Act 2 information doesn’t account for the time in between flights when turning around the stairwell. I figured it’d be more accurate to do that when trying to make the systems of equations application in the sequel question.